I can see by the way turkeys are fleeing for Canada that it must be time for Thanksgiving! This is a two-partner swap - so pay attention and send out TWO cards - one to each partner! This swap is super simple and low stress: Buy two Thanksgiving cards, write a little note inside, and send it to your partners. What you write is up to you. You could tell your partner about your Thanksgiving menu, some things you're grateful for, or maybe a favorite Thanksgiving memory. You can write anything, as long as it's more than "Happy Thanksgiving." No cheating. What does that mean? You can't just write down your favorite Thanksgiving quote or joke, sign your name, and call it a day. Write a few sentences - you can do it! No quotes. Write a note in the card - at least four sentences long. 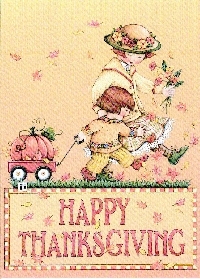 If you receive a Thanksgiving card with a note written inside, rate a 5. While I tend not to have a minimum rating posted on my card swaps, be forewarned - I do check profiles. I check to see if there are comments to low ratings (and sometimes even email your partner to see if you attempted to make it right), I check dashboards to see if there are swaps with past due dates, and also try to keep abreast of problem swappers and weed them out as well. That includes drama llamas, non-raters, and just plain old sucky people. A. They use FOWL language.